Jack Shadbolt was one of those artists who never flagged in his pursuit of variety. A great reader, writer, speaker, teacher, wanderer, visitor to museums and observer of nature, he had more periods in a lifetime of painting than your average ten. Pen and ink, charcoal, watercolour, acrylic, oils, gouache — panels, paper, card, canvases and grandiose murals — nothing stopped this cocky, moody guy. “Twenty-five Birds of Good Omen” (ink and acrylic on watercolour board) always seemed to me to exemplify his energy. We’ve illustrated it along with others at the bottom of this letter. Every one of the owls in that painting has a distinct personality. Singular species — dramatic variety. Jack believed in pushing his mind, and while intuition was important, he felt an artist had to be perpetually flexing the boundaries. There’s wisdom in those owls. Make a little thing and then a large one. Make a simple shape and then a complex one. Make conjoining edges soft, hard, run over, or falling short. When repeating motifs, vary size and direction. Don’t fear winking, blinking, teasing, humming humour. Cruise the work for further potentials for imagery. Obfuscate, cover up, smudge or overhaul boring passages. Make gradations where possible, both wet and dry. Mix things up — numbers, owls, flags, butterflies. Look for opportunities to monumentalize and feature. Let motifs cross over and interfere with other motifs. Look for things that suggest other things, and hint further. Relish the opulence, lusciousness and seduction of paint. Point, and let things react against one another. Patch, and let things lie close and love each other. Try to think of and live in the fineries of Nature: cocoons, flowers, birds, butterflies, eggs, reflections, leaves, sticks, bones, echoes, etc. Think also of emblems, badges, mandalas, signs, glyphs, totems, birth, wonder, light. Rawness, death, decay and disfigurement also have their place. Life and art is a bombardment of variety. Those owls know it, why can’t we? Esoterica: The trials of a restless soul: Every day is a restart, a trial run and a stumbling sortie. Pushing yourself, you set up for both failure and triumph. It’s good to keep in mind we’re in the business of showing people something that they may only partly understand or not yet know at all. We are in the business of prodding. Variety within regularity cracks open the hard-boiled shell. When you think of it, ours is quite a valuable profession. 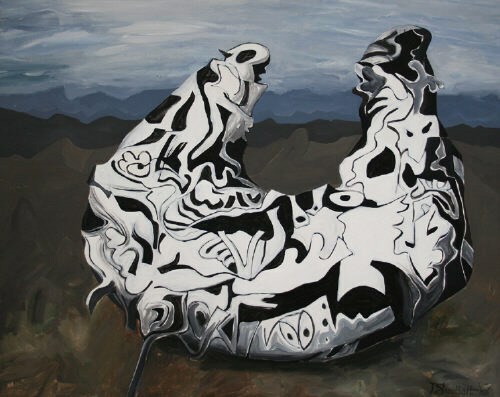 I have a very fond memory of sitting mesmerized for two hours in front of a four panel painting in a retrospective exhibit of Jack Shadbolt at the Glenbow Museum in Calgary, Alberta a few years ago. The paintings from your clickback were also part of the exhibit. It all had a profound effect on me. He is most definitely one of my favorite artists. There is a love and lust for the full experience, process and immersion of and in art that is absolutely contagious. It makes me proud to be an artist every time I think about his art. I highly recommend this video — Transfigured: Jack Shadbolt Inside the Mind. 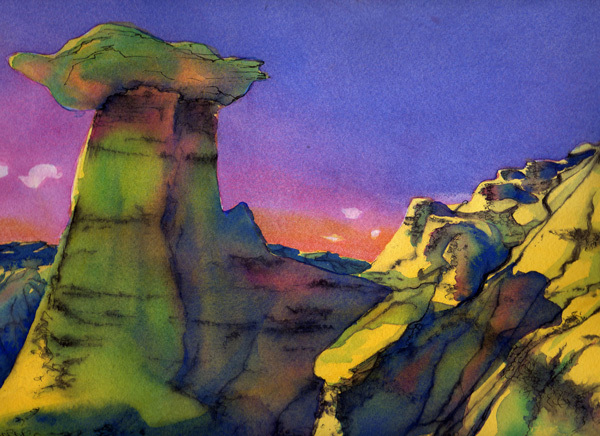 I love your “Hoodoos.” Rich in color, lovely! 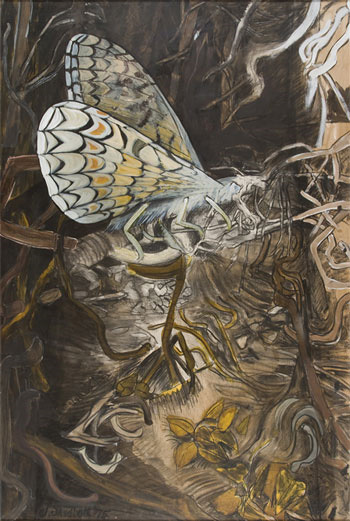 I admire your use of Jack Shadbolt’s underlying figures and beyond that the glory of the whole! Surely you meant to put the monument of a sea lion with a cat’s head looking backwards, the two cats in the shadows (one with a long tail), or is it a dinosaur with a cartoon head, the owl to the very left, and the skeleton head and arm. Or maybe I’m just “seeing things!” Either way it all comes together in a mesmerizing painting! I am a self taught artist in the making. Appreciated by me is your straight forward honesty and experiences… and of course your teaching of technique and artistry. 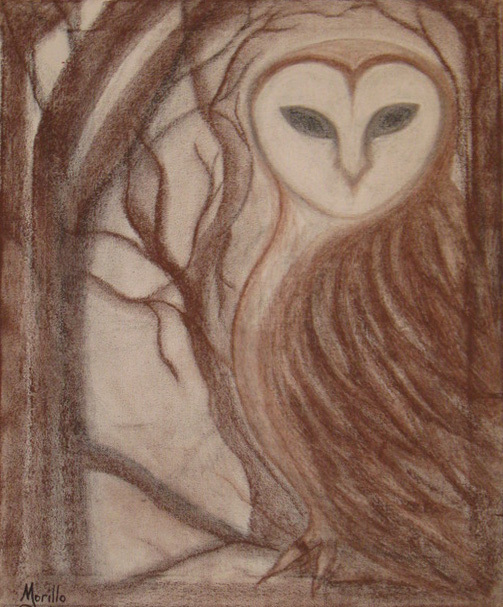 I have always loved owls and created one for my grand daughter since she loved it so much. It’s called Ariel’s Barn Owl which she hangs on the wall at her bedside so she can look at him when she goes to sleep. I believe in putting rings on my owl’s claw for effect. Sweet,your grand daughter is a lucky girl! Thank you so very much Rose.. I actually had no idea until now that Robert was kind enough to post my artwork. Thank you !! In 1968 Jack Shadbolt wrote In Search of Form. Long out of print and difficult to find, it’s worth picking up when it lurks on the dusty shelves of used book stores. We all work with a set of tools in the search, Shadbolt thought, and many of us are short of tools. He writes: “I have come to see that an artist is not given a form — a style — but his nature merely gives him the ingredients wherewith to shape an equation of life.” To Shadbolt, life and art were intertwined, as architecture is entwined in how we live. One senses the awkward, reaching, tentative way an artist gropes toward his place in the world of art. Perhaps living in Washington DC with our so many wonderful museums has made me want to wander into a variety of styles, mediums and even eras of art. Living in any city with many art museums influences an artist in different ways but most seem to find their own path and follow a course to their art destiny. I feel constantly torn between knowing I should stay with one medium and exploring all the nuances yet wanting to explore everything. Does viewing, loving, and creating in different mediums make one never able to settle down to a personal style? Does staying in one path bring a better knowledge of the many ways of that one medium? Does a full exploration of one medium develop a better personal style than working in many mediums? (RG note) Thanks, BJ. We live in an age of artistic literacy. As well as relieving the sameness of our own direction, people, including artists, go to museums and media to find out how others do it. Too much is a dangerous thing, but it’s pretty well impossible to avoid. At some point an artist must go to his island, close his doors, get to the bottom of one medium or another, and dig around in the library within. Wow – really cool painting! I also celebrate artists who explore different media and techniques. If any single language had all the vocabulary to say everything anyone might want to say, English wouldn’t be so full of foreign words! Somehow this reminds me of a gallery show I saw in NYC displaying maybe half a dozen works of one artist. Broad expansive canvases in huge blocks of the same delicately differentiated neutral tones and big soft orange balls. They looked like a set of dishes, with about as much emotional content. I don’t mind someone digging deep into a single concept and exploring its possibilities, but beware of the dry hole. Jack Shadbolt sure wouldn’t spend much time in such a hole. 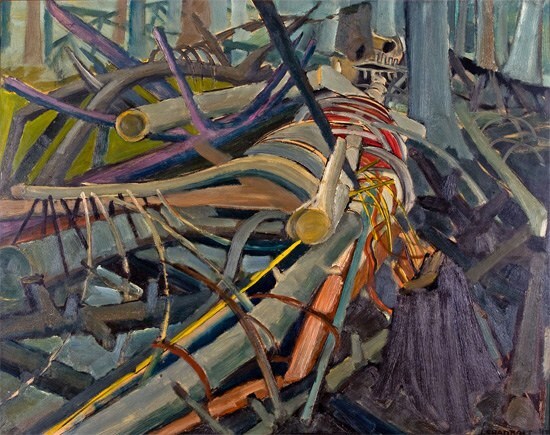 I knew Jack Shadbolt when I was a student at the Vancouver School of Art (Emily Carr) in the ’70s. He was a self-centered teacher who I think was disappointed that he had never been crowned the King of North American Painters and I think he resented teaching. I think his wife Doris, who was an intellectual and a published author, drove him and in a way made him the man that he was. Shadbolt always seemed to be searching, but he could not leave alone those artists he admired — Picasso, Miro, Graham Sutherland, etc. Numerous trips to Europe and a willingness to jump on whatever popular bandwagon was then going perhaps sullied his personal direction. Further, he always said that in order to be cutting edge, things had to be morbid or ugly. He was, as most people know, never satisfied, and toward the end of his life, reworked and covered up many of his finer earlier pieces. As a teacher he was mostly absent for me. 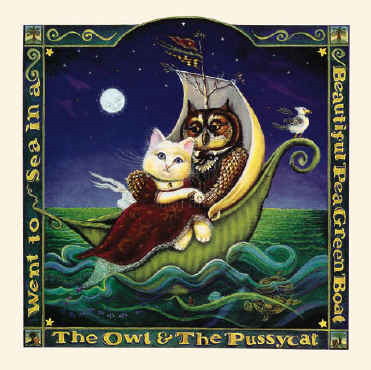 I love your Owl and Pussycat. I am developing that part of my being that can and needs to paint while having lived mostly in that part of me that is able to collect art. I am a grateful graduate of Temple University here in Philadelphia which has as its mascot the owl. 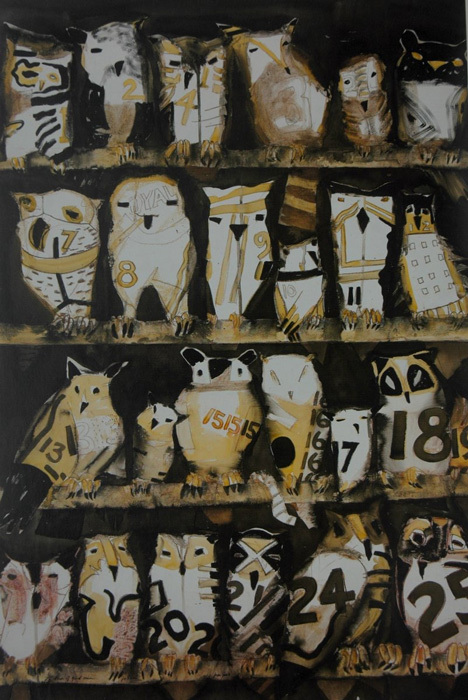 I would very much like to acquire the 2 owl paintings you show by Jack Shadbolt. Can you advise me how I might go about doing that? Thank you. (RG note) Thanks, Dennis. Jack Shadbolt passed away in 1998. The painting of the 25 owls which we illustrated was in the estate of his late wife Doris Shadbolt (1918-2003) who I also knew. 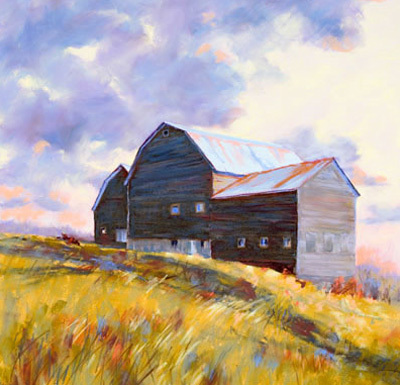 Jack’s work comes up in auctions from time to time and has a tendency to sell well over estimates. There are no current owls on the market that we can find. 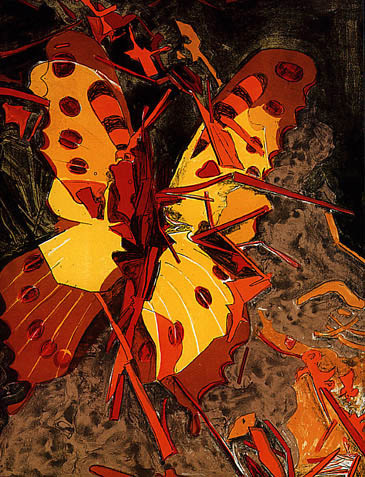 Recently a butterfly painting Summer Icon estimated at $50,000 to $70,000 sold for $152,000 CDN. The book How Successful Artists Study by Samuel Adoquei is really all that and more. It really is a book for everyone whatever their training or level of jadedness. There’s lots of reality and common sense, the kind that comes from common experience, that we are looking for but seems elusive. University was great and I highly recommend it or Art school but realize that it is strictly a beginning. It’s a wonderful self indulgent time to spend on your art. All the art you can eat and digest but not everything on the menu will be to your liking. Try it at least once or twice to see what all the fuss or commotion is about and then try it again. I always felt sad for the students who came into school and never went outside of their comfort zone. School was good as it got me in the activity of making art. It was fun figuring out how to do it, where to do it and to try out different ways of doing it. Now I have several areas of skill and experience that helps me do it. Funny thing, I count only 24 birds not 25, maybe he is making a point or just can’t count? Maybe he is making a point, I count 25. I think the painting was cropped a bit in the photograph. Thanks for Jack’s thoughts. They are helpful. Can anybody expand on this thought with examples? Art, like science, like religion, like any human endeavor, is an attempt to communicate one persons experience of living, to another. We as artists are successful, even if that other, is no other than ourselves. of course, that won’t pay the bills, while communicating to ‘others’ might. 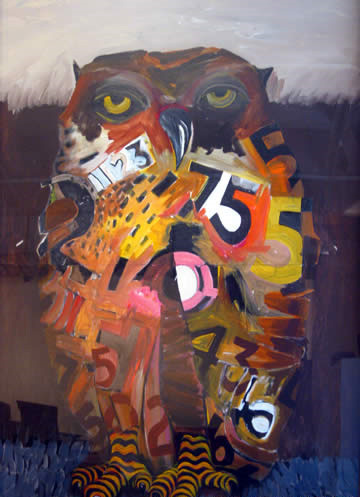 By putting numbers on his owls, Jack Shadbolt took his creative motion further than depictions of owls, or delineation of numbers. But numbered owls, now that’s something. Something un-boring and not seen every day. Now see flags in butterflies wings, or the bones of the dead in white and weathered beach-wood. Your piece on Jack Shadbolt brought back fond memories for me. As a child I would visit my uncle in North Vancouver in the summers. He was a high school teacher and a potter. I think he saw the artist in me way back then, as he always encouraged me to make things. What I also remember vividly was the large Jack Shadbolt he had at the top of the stairs, a large panel of dancing sunflowers. I can still see it in my minds eye today, and remember being captivated by it. It contained all the elements in his list resulting in wondrous visual entertainment, made possible through variety. It was also reassuring to me to read what you wrote about Shadbolts’ work with various mediums, always experimenting, as I do myself. Perhaps I am a poly-artist. Some one wrote once that artists are similar to scientists, always looking and experimenting, and I quite agree. It’s only in this way do new wonders unfold. Does anyone know how to pronounce Genn’s name? Is it like the J in Jesus, or is it more like the G in God? So much of painting, whether traditional or modern, depends upon the presence and interaction of shapes and patches within the painting itself. It’s almost as if subject matter is of secondary importance. If the gestalt is weak, the painting will be weak. If the gestalt is strong, the painting will be strong. Why would anyone care what jack Shadbolt’s wife was like or if someone liked him as a teacher? This web site used to be a great place to immerse in art, but lately there are some mean spirits lurking. I’m in agreement with Shadbolt: owls are a great subject for painting. Their anatomy is amazing: an owl has a very very long neck — feathers make it seem short — but that is why an owl can turn its head in many directions. Also an owl flies silently. The more I read about owls the more I have enjoyed painting them.